Gender role literacy: Girls in science? Over 30,000 objects are now available for anyone to savor and study online, for free, in impressive high resolution, in Google’s ‘Art Project.” This is 30x expansion from the thousand objects in the first version launched in February 2011. See our prior article, The virtual vs. the real: Giga-resolution in Google Art Project. The project now has 151 partners in 40 countries; in the U.S., the initial four museums has grown to 29 institutions, including the White House and some university art galleries. “Being able to teach machine learning to tens of thousands of people is one of the most gratifying experiences I’ve ever had,” says Stanford University computer science professor Andrew Ng. Over 12k students received a 'statement of accomplishment' from Ng’s Fall 2011 course. 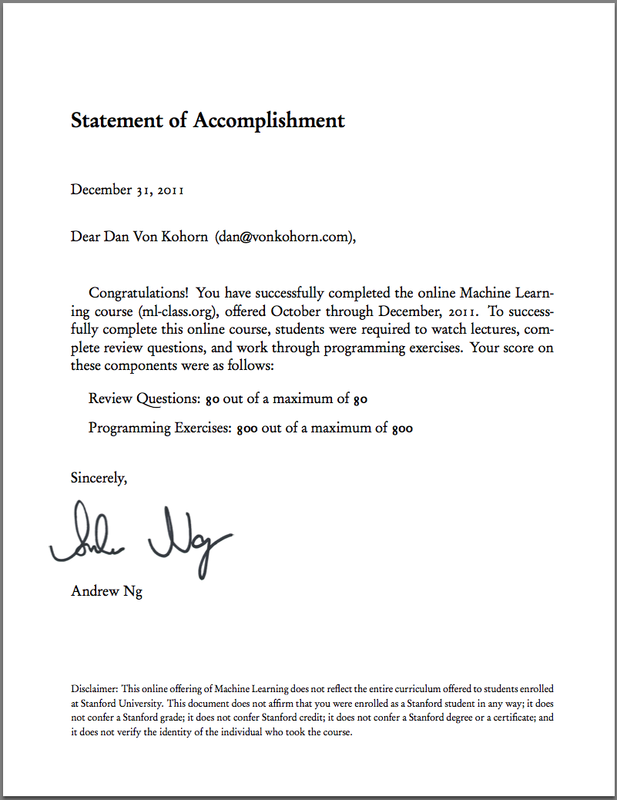 Over 100,000 students signed up for his free, fall 2011 course on machine learning. The impacts were huge. Over 12% of the students completed the course, and received a statement of accomplishment. Ng says he “heard many stories from students about how they’re using it at work, about how it’s inspired them to go back to school, and so on.” In contrast, Ng’s normal, for-credit course at Stanford, one of the most popular on campus, would enroll 350 students. It’s part of a new revolution in higher education, and it’s serious learning. They deliver complete courses where students are not only watching web-based lectures, but also actively participating, doing exercises, and deeply learning the material. Students are expected to devote ~12 hours a week to the course, to read and watch course materials, complete assignments, and take quizzes and an exam. Online students did not receive one-on-one interaction with professors, the full content of lectures, or a Stanford degree — those who completed the course received a statement of accomplishment. Course materials include prerecorded lectures (with in-video quizzes) and demos, multiple-choice quiz assignments, automatically-checked programming exercises with an interactive workbench, midterm and final exams, a discussion forum, optional additional exercises with solutions, and pointers to readings and resources.